Aria is an amazing four year old little girl from Manurewa, Auckland, New Zealand. Aria received her gift of life on the 6th of February 2010, a small bowel, kidney, liver and pancreas transplant at the Nebraska Medical Center, in Omaha, USA. 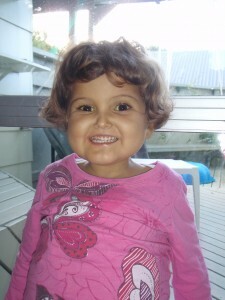 Sadly the new intestine has rejected and Aria was relisted on the organ transplant list on the 27th of April 2010. Aria received her 2nd gift of life on Mothers Day 9th May 2010. Aria’s story begins after birth when she was diagnosed with a very rare condition of the bowel known as total intestinal aganglionosis or total Hirschsprung’s disease. There is no cure and it means she will never be able to digest food. Total intestinal aganglionosis is where there are no nerves cell throughout the entire bowel to squeeze the food along to be digested. Hirschsprungs is common where a portion of the bowel contains no nerves and can be fixed by removing the effected portion of bowel and reconnecting the healthy remaining bowel. Aria’s form of the disease means this is not an option because there is no healthy bowel. This news was devastating to her parents Hamish and Anita who were told that nothing could be done to save their baby. It looked like the end of the journey for Aria but really it was the start of something amazing. Dear friends visited the next day and brought hope. That hope was the possibility of a bowel transplant and also the idea of Aria going home on TPN (total parental nutrition). Aria has now lives at home with Mum and Dad and receives her ‘food’ thru her Hickman line in her shoulder directly into her blood stream. She also has a gastrostomy that drains her stomach of the bile that has no where to go. Life is not straight forward however. Aria faces the threat of line infections as bugs can easily get into Aria’s blood stream thru her Hickman line. Connecting her to TPN each night must be done under sterile conditions to avoid this. TPN is also very hard on the liver. For babies that live only on TPN the risk of liver failure is high leading to death. Up until December 2008 Aria had perfect liver numbers but now her liver is struggling. There is also a problem with Aria’s kidneys. Her condition is because of a genetic flaw in her DNA which has also caused her kidneys to be unusually small. This causes abnormal kidney function as her small kidneys are struggling to keep up with her growth. Because of this she will also need a kidney transplant. Aria’s only hope of long term survival and a chance to eat rests in small bowel, liver, pancreas and kidney transplant. These organs have come from a single child donor whose family made a brave and difficult decision to donate life at a desperately terrible time. This operation is not done in NZ or Australia but the best place is America with the cost of $1-$2 million US dollars. It is still a risky operation but the odds of survival are getting better as advances in medical knowledge continue. Her family and friends are busy fundraising for the cost of living in America with no income for 1-2 years. The NZ Government/tax payer is covering the cost of Aria’s medical care and accommodation. Please consider some of the many ways in which you can help out or support Aria and her family. Aria is a bright smiley little girl who handles the trials in her life amazingly well. Her life is a precious gift from God who is taking the MacDonald family on a journey according to His great purposes. Filed under Uncategorized. Comments RSS. Good luck Aria! Hamish and Anita, we wish you all the best in helping your beautiful little girl. Our thoughts and prayers are with you. Jo, Rick, Cadeyrn (6), Tallen (5), Dallandra (3) and Alira (10mths). God has blessed you with a beautiful little girl and God will take care of her. My daughter Katie was born with HD and diagnosed at 8 weeks of age. She lost 18.5 cm of colon after pull-through surgery. God bless you wee Aria, and may I say you look like a Macdonald, really beautiful , I wish you all the best. I am leading worship in our church tomorrow, and wanted to back up what I was saying, and strength for the day bright hope for tomorrow came into my head …….. so I googled and your story came up. You have a beautiful daughter ……… I pray His strength for you every day, and a bright hope of healing for tomorrow. All things are possible with Him. God bless all of you ……… delighted to see you have another child, Boy or girl? I am sorry I cannot tell by the name alone. Great article and great site. I know I�m not a perfect parent so I�m always looking for great ideas and tips on how to improve. Wow you are an absolute beautiful girl, look at those eyes,! god bless you sweetheart, keep going strong. Sending lots of prays for little Aria and her family. She is beautiful. I am from Liver Families and wanted to show you my support. My son has Biliary Atresia. Your little Aria is a true inspiration. My own Auria had a heart defect when she was born, in July 08.. which was corrected at 3 months old. I can only hope for as wonderful of an outcome as we have had, for your little Aria. Such a pretty little girl with such a beautiful name You are in our thoughts. I watch out for Arias post everyday. I pray that she will continue to improve and you are all a testament to God’s glory and healing. I have just found out about Aria and her family’s plight. Above my dining room table I have a photo of a beautiful sunset. The caption below it is, “Lord help me to understand that nothing is going to happen to me today, that you and I can’t handle together.” He has been with me during my kidney transplant and other major surgeries. I know He is beside you, to help you all through this tough time. May God Bless You. I have just found out about Aria and her family on a program that was viewed this morning, it was called Attitude. I found it was just amazing the strength and courage of this little girl, and her parents. Our thoughts and heart go out to you all, god bless. xoxo. I like Gail watched this mornings episode of Attitude, and saw a family with tremendous strength during a time of need. We are all watching and send our best wishes. What a brave little girl!!! My wife Leigh and I watched you on TV “Attitude” last week. A big hi from Auckland New Zealand!! We wish you all the very best and have made a donation that can help. What an amazing little girl. I wish you all the best for the future. I just watched your programme on T.V. (Attitude) and I just wanted to say how extremely strong Hamish and Anita are! You an inspiration to other parents and families and my heart is filled with love and best wishes for you and Aria. I know you will stay strong and keep fighting for Aria and each other. Aria has an enduring spirit and a hopefulness that shows she is here for a reason. By being open to the opportunity for greatness, great changes can happen. Strength comes with hope and faith. You have a lot of courage and love to sustain you. Best wishes for you and your little girl. I have been following Aria on the Attitude TV show. You are doing a mighty job. Stay strong – you have a lot of people in NZ wishing for a speedy recovery for your dear little girl. I too watched the “Attitude” program last Sunday morning. What an inspiration you all are – your courage, strength and love for each other. Away from home and family it must be the hardest time. Little Aria is surely a gift from God and my prayers are with you all. 7)I will uphold you with my victorious right hand. May you continually be conscious of God’s faithfulness which is new every morning, His love which never ends and His presence which will hever leave you. There is nowhere that God isnt. Hey…we are friends you havent met yet, but in the family of God. Happy Birthday Princess Aria. May God be with you and your family today. May you feel his presence today. May you have peace, and joy and His strength. Bless you from Kaitaia, NZ. Just watched the Sunday programme in New Zealand on little Aria. What an amazing little girl and what amazing parents. Our prayers are with you in New Zealand. I also watched the tv programme and 30 minutes later I am still in awe at the bravery of Aria, the total commitment of her parents and friends and tremendous skills and love given by the surgical team. May God bless you all. Åker ni till Lund och vill bo riktigt bra så testa Grand Hotel. Ska ni även äta något gott där så kan jag verkligen rekommendera räkmackan. Zoo – a burgh in the province. Lublin, Zamosc in the district, the bottom of urban-rural commune Zwierzyniec. In the years 1975-1998 the township administratively belonged to the province. Zamoœæ. According to GUS statistics from December 2009, the burgh had 3 278 inhabitants. To the west of Zwierzyniec 3 km away is the line between lime-sand Roztocze Middle and West Roztocze loess. The burgh on all sides is surrounded past forests, which reside 66% of the commune. The most agent building in metropolis is a church on the islet of St. Nicholas. John of Nepomuk from the Baroque facade of the mid-eighteenth century (1741-1747), funded near the then Ordynat Thomas Antoni Zamoyski. The restrained up-country murals are Smuglewicz Luke. It should also conscious of a brewery founded by means of Zamoyski in 1806 in the celebrated building is in these times the public limited company’s bottling beer Perla Lublin – Lublin Breweries. In the courtyard of the shop since August 2000, every year is Summer Photograph Academy. Simple captivating and on the verge of unsung district is Zwierzyniec Borek. It is a complex of 71 colourless houses that were built at the hairpin bend of the 20s and 30 Twentieth century, when the Ordinance Zamojska peasants gave the precinct a waiver of rights to easements. Borek creates six streets, one of which, st. Tapering, is single because of its comprehensive and fully-preserved awkward buildings. Ramble the streets and other Borek takes us into the mood of the interwar period. In the years 1940-1944 the Nazis created a encampment exchange for civilians and resettlement camp for the inhabitants expelled from the Zamosc region. In this square footage there is modern Roman-Catholic Church. Our Lady Beauty queen of Improve in the another half of the twentieth century. Strongest article: The expulsions of Poles during Men Conflict II made by the Germans. What’s the subject of life – to get rich? All of those fellows out there getting rich may be dancing round the real subject of life. We dont perhaps experience I actually dawned, yet i believed the following post was initially good. Cheers! I’ve been surfing on-line more than 3 hours today, but I never discovered any interesting article like yours. It is beautiful price enough for me. In my opinion, if all webmasters and bloggers made just right content as you probably did, the web will probably be a lot more useful than ever before. I would love to see more posts like this!.. Great blog btw! vakantie Subscribed.. If an analyst were found you can be working considering unquestionably the investment bankers taking a new company Â¨Â¦vident , that could be virtually any violation from settlement, said Thomas Gorman, a complete partner possibly at the exact law firm Dorsey & Whitney and therefore author belonging to the SEC Actions blog. In the event that youre nevertheless in regards to the fencing: get your preferred earphones, mind right down on the Greatest Purchase and get in order to connect all of them suitable Zune after that a good ipod device and pay attention to which seems easier to your person, as well as that user interface means that you can grin much more. After that youll understand that is befitting a particular person. Hello just about most, C came across this website because of real good fortune whenever running around round the internet today, as well as delighted which i do! I actually do including the web page framework along with shades, however We should to point which Im getting issues whenever this lots. Im utilizing Shiira 1 internet browser with regard to macintosh, and also the aspect screen doesnt line up the right way. im assured used a similar design on the clientele site, however the menus appears Okay upon my own. I’ve a concept the issue is inside my finish & I guess its time and energy to exchange! Good site you have got here.. It’s difficult to find high quality writing like yours these days. I truly appreciate people like you! Take care!! Admiring the commitment you put into your site and detailed information you provide. It’s nice to come across a blog every once in a while that isn’t the same out of date rehashed material. Excellent read! I’ve saved your site and I’m including your RSS feeds to my Google account. Actually when someone doesn’t know afterward its up to other viewers that they will help, so here it occurs. I became suggested this site by way of my personal cousin. I am will no longer certain whether it distribute will be authored by means of him or her as nobody else understand like precise somewhere around my own dilemma. That you are incredible! Appreciate it! Будто похудеть при помощи шоколада? как скоро ей оглашается бой. Чтобы заказать Шоколадка про заполните форму и надавите кнопку “Заказать”. вещества, коие благоприятно влияют на работу сердечно-сосудистой порядка и нормализуют влияние. подростков с 12 до 17, коие придерживались различных диет и водили здоровый стиль жизни. других. Разъясняется это тем, будто шоколад убыстряет метаболизм. отложений. И еще одно интересное надзор. This paragraph posted at this web site is genuinely good. It’s remarkable in favor of me to have a web site, which is good designed for my knowledge. Asking questions are actually fastidious thing if you are not understanding anything totally, however this piece of writing gives good understanding even. had been properly researched and the Flordis Remotiv is one of those. best and which is not. through websites that specialize in international calling cards. Keep on writing, ǥreat job! that can be used as art, toys, or containers. Also, The contents are masterwork. you have performed a great process in this topic! This post is really cool. I have bookmarked it. Do you allow guest post on your blog ? Hey guys, my name is Victoria! People ask me “Sir, Victoria Patton, I need your professional help” and I always accept the request, `cause I know, that only I can solve all their problems!